For a brief moment, I considered bumping The Hangover from the list. Then I decided to watch a few minutes of this a couple nights ago. I ended up watching the whole thing. And it held up really well. There were plenty of funny moments that were still funny ("What is this? A snakeskin?"). There were funny moments that I had forgotten about ("I didn't know they gave out rings at the Holocaust."). There were funny moments that I don't think I noticed the first time around ("I'll hit an old man in public!"). Haley once stated that Bradley Cooper's character Phil reminded him of me, and I take that as a compliment. It's because of his attitude as he's trying to leave school for his weekend. "It’s the weekend, Budnick, I do not know you. You do not exist." And soon after, "Shut and drive before one of these nerds ask me another question." And then there's Phil's outgoing message on his cell. If I didn't also use my cell for students and their parents, I would definitely change it to this: "Hey. This is Phil. Leave me a message. Or don't. But do me a favor. Don't text me. It's gay." Though I would probably change the name... But still, don't text me. One thing I give the makers of this movie, especially the writers, credit for is telling the story they way they did. It's told from the next day as the characters are trying to put things together. And yes, I know that's the whole point. But your typical mainstream comedy would have just told the story through the night. After all, that's the most outrageous stuff. But we're only teased with that. And it worked for me. Comedy is subjective, so I know it's easy to disagree. 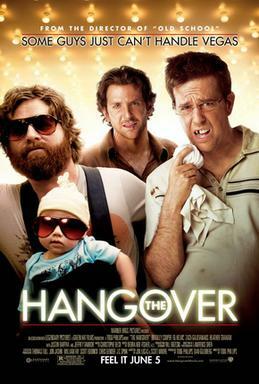 And I saw The Hangover before expectations are too high. That said, I invite you to read Nolan's counter argument, and I invite him to click on the "WRONG!" button on my new reaction meter down just above the comment link. I came off too negatively in my piece, because my angle was that it was overrated. But notice I still gave it a B and said it was very funny. A few weeks ago, I read a blurb about it that perfectly summed up my feelings in far fewer words than I used: "More amusing than hilarious."